Lovely cutie Sass! Like her colours too! I don't go for greens normally but this is great Sassy! I had a bad night sleep wise too - when will the hot flushes stop? Hope the visit to the Drs went ok.
Sassy you made me laugh out loud with your chapel pegs!!! Hope the doctor's visit helped and she was able to offer some good advice. Love, love, love your card. I have those papers but have real difficulty putting them together - thanks for the inspiration. Have a great weekend and thanks again for the laugh. Love, love, love it!!! Love the sweet image, papers and all the pretty embellies. Aww this is gorgeous! what a cute image - she's adorable! and I love your colouring. The papers and embellies are perfection - it's a real stunner! Oh Sassy, you do make me laugh, we love your waffling and fun personality! Such a gorgeous card, I love that paper with the birdcages on! Sorry haven't been by in a while, our internet was down for 2 weeks!!!! Hope your appointment with the Docs goes well, and you are tickety boo. A brilliant card with fabulous papers. I don't know where you are hiding them but they are stunning. I love the little lanterns and your cutie Honey Pip. 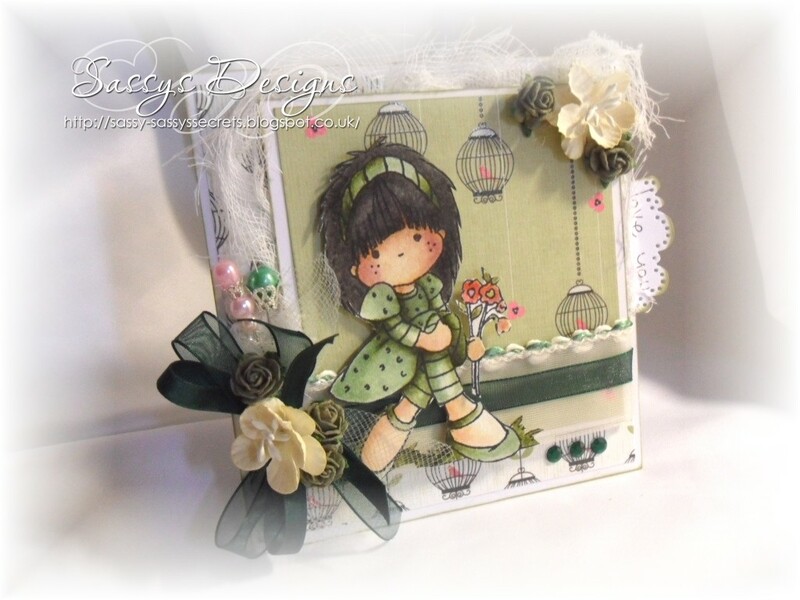 You are brilliant at cutie cards and your beautiful Vintage. Your card is so cute. Love that hair! The papers are so pretty. I love the sweet flowers and your coloring looks fabulous. what a wonderful card, Hunni!!! you've coloured this lil' Pip very pretty at this time of the night...so gorgeous! Hope everything went ok with your check!! Oh Sassy, you make me laugh so much!! Hope the trip to the docs sorted you out. Absolutely love this card!! Gorgeous image and colours and I just love how you've positioned her! I love the Sherbet Pips, I only wish I could colour them this well, you have done an amazing job and I love your papers. Fab design.